Haiku for the urban masses. Who says that safety campaigns have to be boring? New York City's Department of Transportation (DOT) commissioned artist John Morse to build upon his bandit haiku campaign in Atlanta. The DOT's goal was to raise traffic safety awareness. In 2010, New York based artist and writer John Morse installed 500 haiku bandit signs at busy intersections in the ATL. What separated Morse's signage from other bandit signs that blight the country offering get-rich schemes, junk removal and dating sites was that his bandit signs were written in haiku. In the Big Apple, Curbside Haiku strike a bit of whimsy with safety advice in the form of haikus. In a city where an estimated 200 000 people cycle to work or school on a daily basis, traffic safety and awareness is a concern. The signs, which function like your standard run-of-the-mill traffic signs, are eye-catching because they are situated at eye level. Located in 144 high-crash locations that neighbor cultural institutions and schools, curbside haikus began sprouting up throughout the five boroughs in November 2011. Morse created his 12 original safety-minded haikus that accompany an equal number of rudimentary pieces of artwork that resonate in bright, vibrant colors. Colors that stand out among the clutter that is New York City. Curbside Haiku is part of a joint effort by the DOT and the Safe Streets Fund. 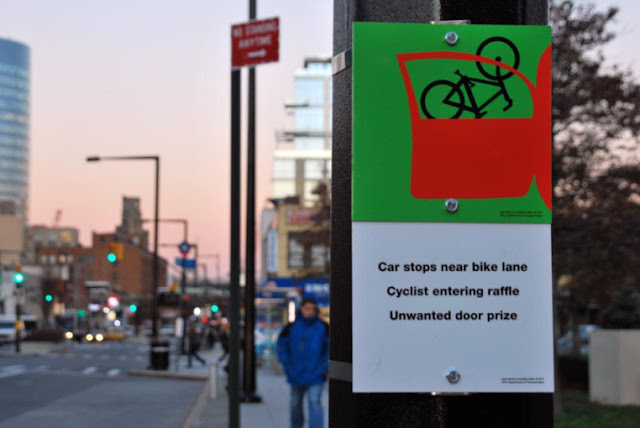 "Safe Streets Fund is a public-private partnership which aims to reduce the number of traffic-related injuries and fatalities in New York City through innovative social marketing and direct education programs for children and others at risk. Through this education we hope build a culture of respect for all users of our city streets." The traffic rolling like waves. While New York City streets are safer for motorists, pedestrians still get killed on the rate of one every other day according to 2009 statistics. A recent study on mortality rates amongst cyclists notes that while fatalities (225) remained steady over a 10 year period (1996-2005) 3462 NYC cyclists were seriusly injured in craches with vehicles between 1996 and 2003. Also unique to the Curbside Haiku program is that two of the twelve signs are written in Spanish. These signs can be found by the Bronx Museum, the Studio Museum in Harlem, MOMA, Flushing High School and the Jamaica Performing Arts Center. If Curbside Haiku grabs you, you can order your own official Curbside Haiku sign or poster through the DOT. All proceeds from the campaign support safety awareness and eduction in the Big Apple. dude....these are awesome...ha...love the concept as well...each has nice grit too...painfully...smiles. thinking out of the box for the public good.